tender, white inner part of shoots/plants is edible raw. cattail pollen is bright yellow and can be gathered by shaking a pollen-laden spike into a bag, which yelds about one tablespoon of powder. pollen can be used as flour, suitable for pancakes, etc. pollen is available to gather before the plant develops its long, brown cylinder resembling a hotdog on a stick. green flower spikes can be cooked and eaten like corn on cob. starchy white core of rhizome can be eaten raw. white core can be boiled, baked, or dried and ground into flour, or boiled into syrup. roots can be peeled and crushed under water, the fibers strained out and the starch washed in several changes of water. fluff from the brown-cylinder can be burned to separate and parch the seeds, which are edible. the variety in Ontario is Common cattail (Typha latifolia). 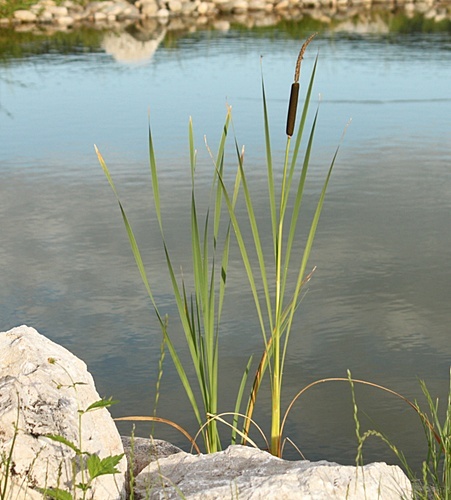 look for cattails growing on the shores of lakes and ponds, in flooded areas and in ditches. warning: do not confuse young cattail shoots with members of the iris family such as Western blue flag (Iris missouriensis). Mature plants are different enough to avoid confusion. A stand of cattail is a free meal that's too good to pass up! Grip the plant and pull up firmly to dislodge it. The tall blade-like leaves are attached along the stem of the plant. Peel the outer leaves away until all that remains is the white central core. The outer leaves may be covered in muck and slime, but the core is clean. Eaten raw, it's crisp and refreshing, though the taste will vary with the soil and water conditions. Six to eight large plants will provide enough stalks for a meal. I favour dipping them in ranch dressing.